I’ve been writing about focus a lot lately. Another component of “focus” is having standards. My life and work experiences have taught me there are three kinds of people you want to be really selective about. We can’t pick our parents and siblings but we do choose our spouses, our friends, and our bosses. If you think about it, how much time in a day do we spend at work and home? What time do we spend in between that? 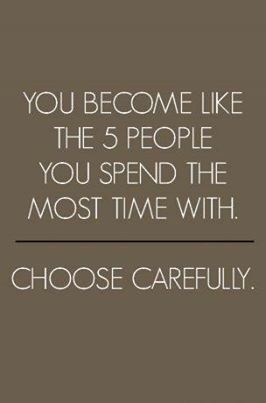 Who are the 5 closest people you spend your time with? Are they the right ones? 1. What attracted you to be interested to each other? Common values? styles? 2. How do your differences compliment each other? 3. What can you learn? How are you growing or have you grown? 4. Are you getting out what you’re giving? In our personal lives, we date. We try on different people and experiences. With time, and maturity in our own self discovery journey, we find a match. At work, we interview. And the interview is just as much about them as it is you. This is guy/gal whose going to give you the things you need to manage your work/life balance. Hint: Knowing who he/she works for can also give you insights as well! Friends are a special category. They are the ones you can air all of your emotions with. They give perspective and no matter what they stand by you. The good ones do. Friendships come and go — picking a few close mates who know you and can give you honest feedback are the ones you want in your corner. You do become like the five people you spend the most time with. Expect nothing short of the best. These are all choices we have within our control.